On Saturday afternoon, a small contingency of local craft beer writers, photographers and a brewer met at Brouwerij West in San Pedro for a personal tour given by Brouwerij West President and Chief Financial Officer, Dave Holop and Founder and Brewmaster, Brian Mercer, as well as their head brewer, Jeremy Czuleger. These photos are from the Founders’ Club party that was held at the Brouwerij West tasting room on Friday evening. The Founders’ Club is a yearlong membership for supporters of Brouwerij West, and one of the many perks is invitations to special events at the brewery; as their Grand Opening is Saturday, this pre-opening party was the first event for Founders’ members. We were treated to samples of their latest releases, Buckwheat Sour and Mør Mør, as well as the seven other brews they had on tap including Sour Orange Wit, Super Orange, Bitter Blonde, Dog Ate My Homework, My First Rodeo, Tripel and Spelt Saison. Vella Pizza was also on hand providing their delicious pizza slices. There were a few hundred supporters in attendance and everyone seemed to have a great time. 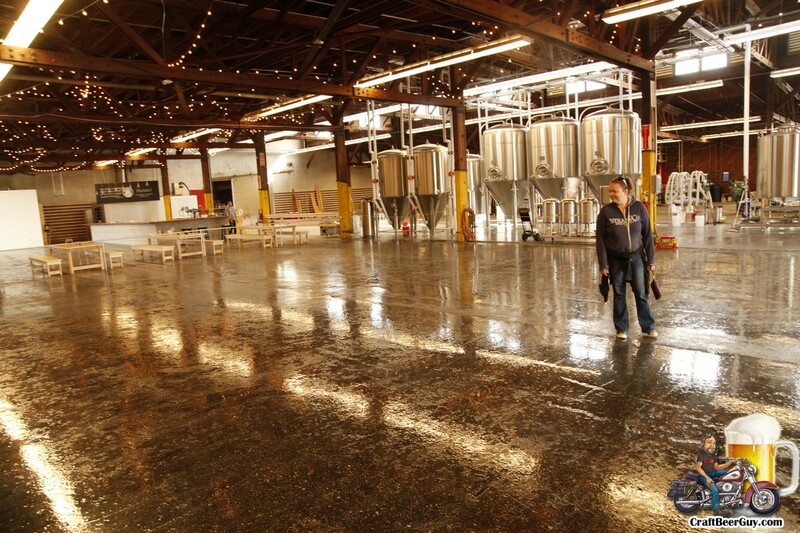 I guess it was at The Festival 2014 put on by the Shelton Brothers back in November of 2014 that many learned that Brouwerij West was planning on opening in the warehouse next to CRAFTED at the Port of Los Angeles. As people waited in line to enter The Festival, it would have been tough to not see the notice painted on the side of Warehouse No. 9 declaring that Brouwerij West was planning on opening in the spring of 2015. Of course, anyone that has been paying attention has probably noticed that the actual opening of a brewery is rarely constant with the dreams and desires of the brewery owners. But good things come to those that wait and patience is a virtue; Brouwerij West will have their Grand Opening on Saturday, February 27, 2016 from 12:00-9:00 PM! Brouwerij West’s owners/founders Brian Mercer and Dave Holop were kind enough to allow me to photograph the building of their brewery so these photos begin back in March of 2015 when it consisted of a huge room with an old leaky roof. As time went on I was able to be there when their brewhouse was being assembled, during one of their first brews, and ending with the Hoppy Valentine’s Dinner that was held this past weekend. For appetizers we had Rose Petal Ravioli w’ Creamy Leek & Bacon Filling (outstanding), Octopus Tartare on a wonton chip with wasabi, and Bruleed Strawberries with Balsamic Syrup & Goat Cheese. The main course had a mix of various vegetables and pasta along with steelhead trout on Parmesan Polenta and Juniper Crusted Pan Seared Duck on a Bed of Faro with Dried Cherry Chutney. For dessert there was Mason Jar Dark Chocolate Cakes with Farmer’s Market Berry Compote & Chantilly Cream. It was an interesting meal and everyone seemed to really enjoy it. 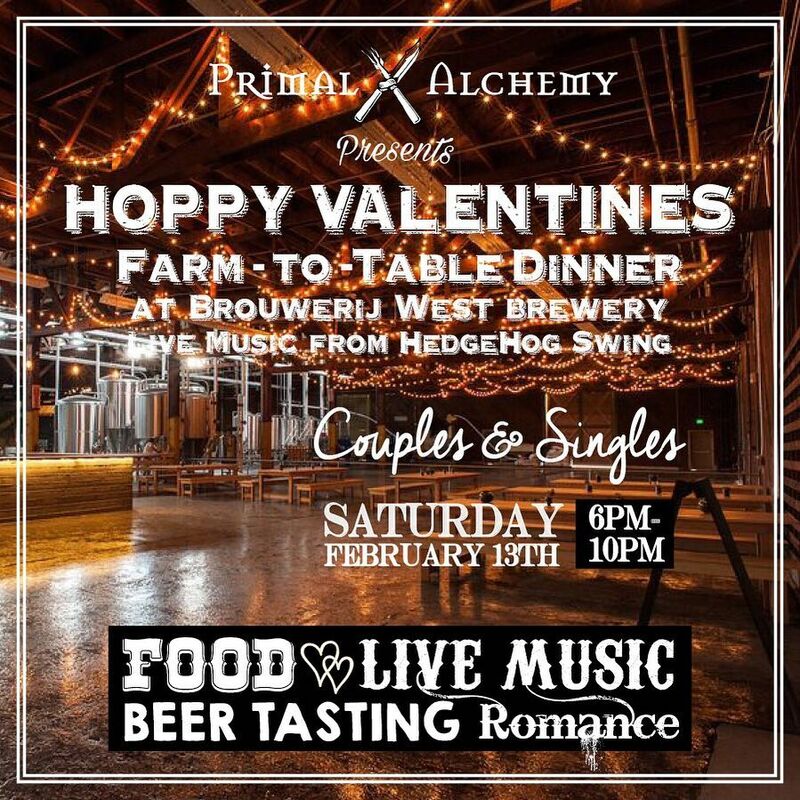 On Saturday evening, February 13, Brouwerij West will be pairing their Belgian style brews with Primal Alchemy Catering’s farm-to-table foods for what should be an outstanding way to celebrate Valentine’s Day with your special someone. Primal Alchemy Catering is owned and operated by Chef Paul Buchanan who specializes in preparing customized menus that are truly farm-to-table, using locally sourced and organic ingredients. Chef Paul has been doing this for more than 10 years and after looking at some of the menu options suggested on their website, this should be an amazing meal. Sometimes it is hard to remember that just a few years ago you could count the production breweries and brewpubs in the South Bay on one hand; now you need both of your hands and a foot to count them all and new locations are being constructed as you read this. A common question that has been debated frequently over the past couple of years is that of over saturation. As a craft beer consumer, over saturation never really comes into play for me although I can understand how a brewery owner might not feel the same way. Of course, I might not feel the same way if all of our breweries were merely churning out the same brews and styles as the next guy, but the reality is that even though we have a dozen tasting rooms and brewpubs to visit in the general vicinity each is unique in their own way. I feel that as long as this trend continues the only problem the consumer will have is deciding which brewery to patronize on any particular day.